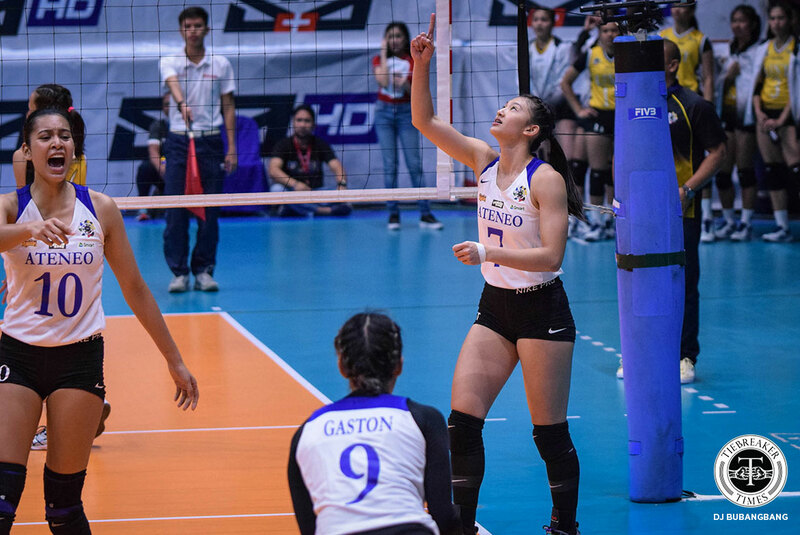 Maddie Madayag broke an 11-year-old UAAP record last Wednesday, and in the process, helped ensure that the Ateneo de Manila University Lady Eagles’ winning streak in the UAAP Season 81 Women’s Volleyball Tournament continued for a seventh consecutive game. The veteran middle blocker scored a career-best 23 points – 11 from blocks – as the Lady Eagles recovered from a two-set deficit to take down UST in a five-set thriller, 19-25, 22-25, 27-25, 25-22, 15-11. Madayag made life difficult for UST’s spikers, particularly Dimdim Pacres. She tallied her record-breaking 11th block in the fourth set by rejecting Sisi Rondina. Madayag then stepped up on offense in the deciding fifth frame, as she put the Lady Eagles ahead for good, 11-10, with her trademark running attack. Her superb performance earned Madayag the Chooks To Go-Collegiate Press Corps UAAP Player of the Week, making her the third Lady Eagle to receive the distinction after Kat Tolentino and Bea de Leon. “I’m speechless, I don’t know what to say,” Madayag said after being informed that she had broken the record formerly held by La Salle’s Celine Hernandez, who had 9 blocks against the Adamson University in Season 70. “I just played my game, and contributed whatever I can for the team, and I just gave it my all,” added the middle blocker. Thanks in part to Madayag’s efforts, the Lady Eagles are now at 7-1 in the women’s volleyball tournament, putting them at the top of the league standings. They will look to keep their hold of the top spot when they take on the University of the Philippines in round 2 of the Battle of Katipunan on Saturday at the Mall of Asia Arena. Madayag beat UST’s Sisi Rondina – who tied Alyssa Valdez’s scoring mark with 35 points in a losing effort – as well as Tots Carlos of the University of the Philippines, Far Eastern University rookie Lycha Ebon, and University of the East playmaker Lai Bendong for the weekly honor given by sportswriters from broadsheets, tabloids, and online publications covering the collegiate beat.